Over millions of years, plants, insects, fish, and birds found their way to the Hawaiian Islands before the arrival of humans. 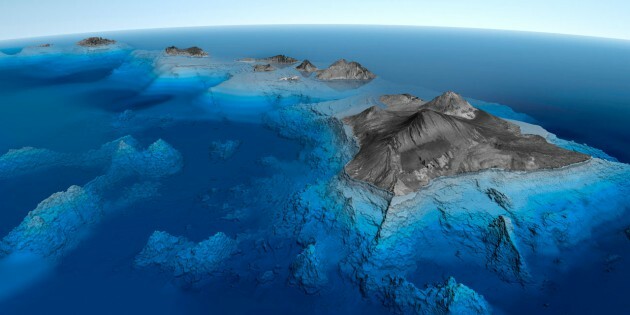 The first Hawaiian species came here via the three W’s: wind, wings, and waves. Once they arrived, these pioneer species adapted to their new home. Over time, many of their descendents transformed into altogether new species: endemic species that are native to Hawaiʻi and exist nowhere else on earth. As a result, Hawaiʻi is an unparalleled showcase for evolutionary diversity. Scientists estimate that, prior to human contact, one new species successfully colonized the Islands every three to five thousand years, on average. That number has since skyrocketed, because of the increased traffic associated with humans. Now, between 30-50 new species find their way to the Islands every year, having originated from points all over the globe. Many of these newcomers are benign, causing no problems, but some have become serious pests: invasive species capable of disrupting the existing natural balance of native Hawaiian ecosystems. In this unit, students learn the basics behind invasion science: what determines whether a species is native, non-native, or invasive, where many species originate, how they got here, and how they impact our native ecosystems. Students answer the question “what species are native to Hawai‘i?” They watch a slideshow (or read an article for homework) illustrating invasive species definitions and concepts. They complete a crossword puzzle to demonstrate their understanding. #2 - What’s in a Name? Students develop familiarity with scientific, English, and Hawaiian names for species. Exploring how and why Latin is used to describe species, students create names for fictional species. Students learn how early Hawaiians told stories to convey natural information. Students create a timeline to visually tell the story of how species colonize the Hawaiian Islands. Students compare the rate of successful colonization during different periods of Hawaiian history: before the arrival of humans, pre-European contact, before the advent of jet travel, and today. #4 - Where Do They Come From? Where Can They Invade? Working with maps, students explore where invasive species in Hawaiʻi came from, how they got here, and what native ecosystems they are equipped to invade. Students play a game of Jeopardy to deepen their familiarity with invasive species facts. They generate their own Jeopardy questions using cards created in Activity 4 “Where Do They Come From? Where Can They Invade,” or flyers included in this curriculum. Students consider which plants and animals are chosen to represent their school, island, state, and country, and why. They list the qualities these species emulate and consider similar native Hawaiian species as alternatives. They read an essay by Hawaiian cultural leader Herb Kane about ʻaumakua, Hawaiian spirit guardians, to explore indigenous relationships to the natural world. 1. How do species colonize Hawaiʻi? 2. What factors make Hawaiian ecosystems especially vulnerable to invasion? 3. What are the basic concepts and definitions of invasion biology? 4. Where do native species come from? 5. Where do invasive species come from? What areas on Maui can they invade? 6. What is a scientific name? How are scientific names useful? 7. How and why do we chose certain species as icons or mascots? • Explore the records kept by botanists who sailed with the first Western ships to visit Hawai’i. • Investigate the debate surrounding certain Polynesian introductions, such as: coconut (Cocos nucifera), Hau (Hibiscus tiliaceus), and indigo (Indigofera suffruticosa), paʻiki (Rorippa sarmentosum). What are the arguments for and against these species arriving here without human aid? What evidence is there to support the idea that they were brought by Polynesian settlers? Bloxam, Richard, Byron, George, and Calcott, Maria, Voyage of H.M.S. Blonde to the Sandwich Islands, in the years 1824-1825. John Murray, London, 1826, p. 86. Evenhuis, Neal L., Barefoot on Lava: The Journals and Correspondence of R.C.L. Perkins in Hawaiʻi, 1892-1901, Bishop Museum Press, 2007. Juvik, Sonia P., and Juvik, James O., Atlas of Hawaiʻi, by Thomas R. Paradise, University of Hawaiʻi Press, October 1998. Ziegler, Hawaiian Natural History, Ecology, and Evolution. University of Hawaiʻi Press, 2002.